4LIFTN is fully insured and licensed and flexible enough to work within your deadlines to provide a quality, honest and reliable transport service. 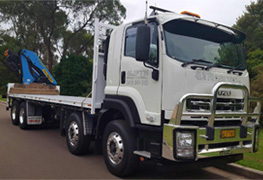 Our loyal base of local and interstate customers have grown through our staff’s dedication and hard work to be a premier Crane hire service in Sydney at a competitive price. If you have any further questions or would like to organise a quote, please Call or Email us today to assess your work site so we can provide the best vehicle for your project. We pride ourselves on our fleet of Crane Trucks that are rigorously serviced and maintained to the highest safety standards in Australia. We are also able to provide a range of vehicles including semi-trailers, crane trucks and semi drop deck trailers. Our crane truck and hiab hire services stand out from other transport companies in Sydney thanks to our expert operators who work closely with site organisers and foremen to help you complete projects ahead of schedule saving valuable time and money.